Bread -- the staff of life -- is probably the most ancient food that is still part of the modern diet. 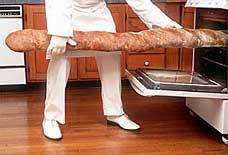 The longest bread on record in the United States was baked in 1987, and was 2,357 feet 10 inches long. That's almost half a mile. When it comes to bread, humans will try almost anything. Actually, when it comes to anything, humans will try almost anything. Throughout the history of Western civilization, bread has played a major role in the development of agriculture, economics, science, politics and religion. It sits at the center of our tables and at the heart of our cherished rituals. Breaking bread is not only the way we begin our meals. It is also a focus for expressing gratefulness for the food at hand. Bread is such a basic part of our social lives that it is even another name for money. And the varieties and shapes reflect the diversity of world culture: Jewish challah, Russian rye, German pumpernickel, French baguettes, Italian focaccia, Irish soda, Arabian pita, Indian chapati, Mexican tortilla. Each of these, with their unique flavors and forms, celebrate our differences and serve as the foundation for meals that nourish body and soul. There was a time when most bread was baked at home and its fragrant, heart-warming aroma filled the kitchen. Today, the lure of convenience has conspired to deny most of us the time and the confidence to make our own bread. Yet the tools and ingredients for a homemade loaf are as available as ever. If they could they speak, they would most certainly invite us to give it a try.